We celebrate the American Revolution as the seminal event in which we Americans won our independence from Britain. It’s ironic that throughout our history we’ve largely remained blind to the fact that Native Americans fought us for exactly the same reason: to preserve their liberty, rights, and way of life from an oppressive power. I’ve been deeply impressed by this fact while doing research for my American Patriot Series. In delving into how the war affected women as well as men, blacks as well as whites, I couldn’t avoid the question of what impact our Revolution had on the native peoples who inhabited this continent long before white people showed up. How did they view the colonists’ claim that England denied their lawful rights while at the same time denying Indians the freedom to live unmolested on their own lands, feed and protect their families, and maintain their long-held traditions? This struggle goes all the way back to the arrival of the first Europeans on the shores of North America. In treaty after treaty, Indian lands and freedoms were whittled away. The loss of land accelerated in the late 1760s and 1770s as settlers increasingly pushed their way into the fertile western territories where land could be had for the taking. And the taking was often bloody, with atrocities committed on both sides. Long before the Revolution the Ohio Valley became a fiercely contested war zone. The Lenape, Shawnee, Mingo, and other tribes made Ohio Territory their homeland due to its rich hunting grounds; fertile cropland; expanding trade opportunities, first with the French, then with the English; and the ever increasing pressure of white settlers’ westward expansion. When the British won the French and Indian War and took control of the trans-Appalachian country, the opposition of the native peoples stiffened. 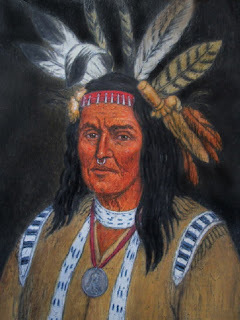 Between 1763 and 1764 a coalition of tribes led by the Ottawa chief Pontiac and Guyasuta, a Seneca-Mingo chief, unsuccessfully tried to push British soldiers and settlers out of Ohio Territory. 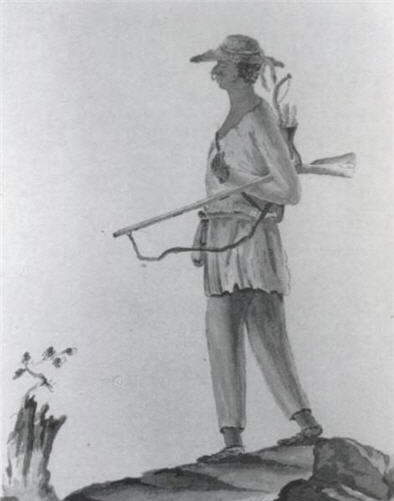 Then in 1774, in what became known as Lord Dunmore’s War, the Shawnee went to war to keep white settlers out of their Kentucky hunting grounds. Their towns and crops were put to the torch, forcing them to give up claim to the land and agree to recognize the Ohio River as the boundary between Indian lands and the British colonies. When the Americans went to war with England the following year, it came as no surprise to the Indians that their lands were once again up for grabs. At the beginning of the conflict, the majority of the tribes tried to remain neutral, but that was not a viable option for long. 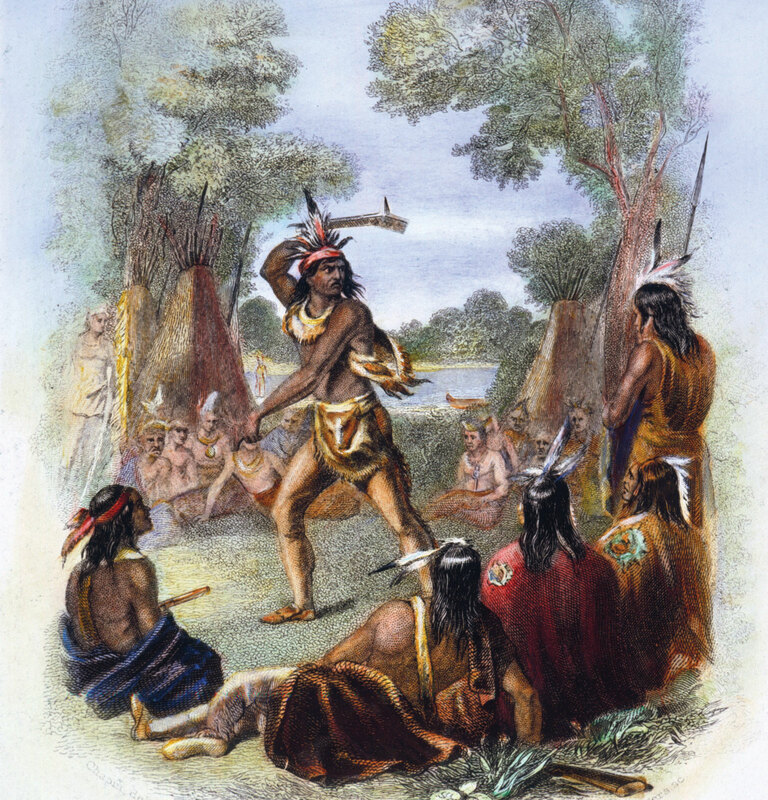 The Stockbridge, or Mahican, Indians of western Massachusetts were one of the first to join forces with the Americans. Later some Lenape, along with the Oneida and the Tuscarora, did the same. But in the end most of the tribes came to see the Americans as the greater threat to their liberty and way of life than a distant English king. 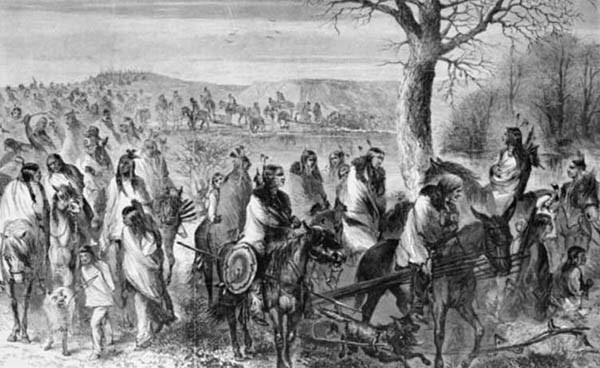 In 1776 the Cherokee independently attacked frontier settlements to drive trespassers off, only to have their communities devastated. Other native nations formally allied with the British and suffered the same result. Among the Shawnee, the great chief Cornstalk tried to cultivate peaceful relations with the Americans, only to be murdered along with several companions by militia soldiers in 1777. Even so, his sister, Nonhelema, continued to assist the Americans and work for peace. But as Kentucky militia crossed the Ohio River almost every year to raid Shawnee villages, about half of the nation migrated across the Mississippi to Spanish-held lands, while others moved farther and farther west to put space between them and the Americans, and increasing numbers joined the war of resistance. By the end of the Revolution most of the Ohio Indians were concentrated in the region’s northwestern area. The Iroquois Confederacy, or Haudenosaunee, was shattered by the war, with the Oneida and Tuscarora fighting on the side of the Americans, while the Mohawk and Seneca allied with the British, tearing apart clan and kinship ties. Like the Cherokee, many Iroquois lost their homes during the Revolution. In 1779 George Washington dispatched General John Sullivan to conduct a scorched-earth campaign in Iroquois country. During Sullivan’s Expedition, his troops burned forty Iroquois towns, cut down orchards, and destroyed millions of bushels of corn. Thousands of Iroquois fled to the British fort at Niagara, where they endured exposure, starvation, and sickness during one of the coldest winters on record. 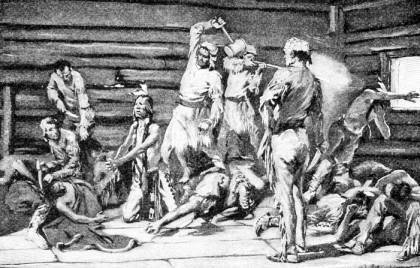 In desperation their warriors attacked American frontier settlements as much for food as for scalps. At the end of the Revolution many Iroquois relocated in Canada to avoid American reprisals. The Lenape were also initially reluctant to take up arms or support the British. Their chief White Eyes led his people in concluding the Treaty of Fort Pitt in 1778, the first treaty Congress made with Indians, in which the two nations agreed to a defensive alliance. But American militiamen murdered White Eyes, America’s best friend in Ohio Territory, and claimed he died of smallpox. Then in 1782 a detachment of American militia marched into a community of Moravian Lenape named Gnadenhütten, or “Tents of Grace.” That these Indians were Christian pacifists made no difference to the soldiers. They separated the men, women, and children, and with their victims kneeling in front of them singing hymns, used butchers’ mallets to beat 96 people to death. Outraged, the Lenape allied with the British and exacted brutal retribution whenever American soldiers fell into their hands. As the Revolution began, in spite of American assurances, Indian nations feared that the Americans’ ultimate goal was to steal their lands. Those fears turned out to be well founded. In April 1783 Britain recognized the United States’ independence at the Peace of Paris and transferred to America all her claims to the territory between the Atlantic and the Mississippi and from the Great Lakes to Florida. No Indians were invited, nor did they receive any mention in the treaty. When they learned that their British allies had sold them out and given away their lands, they understandably felt betrayed. The United States won its Revolution, but in the west the Indians continued their war for independence for many years afterward. Once subdued, they were confined to reservations and were denied their culture and even their language. 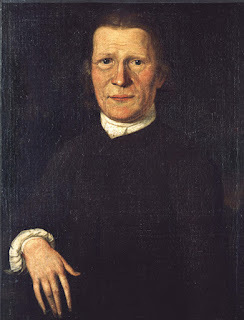 You’ll find accurate and heartrending accounts of what the native peoples suffered in their struggle against white expansion in Black Coats Among the Delaware by Earl P. Olmstead, based on the diaries and letters of the Moravian missionary David Zeisberger, who lived and ministered among his beloved Lenape until his death. They say that history is written by the victors. If you're like me, you learned very little in school about the true history of the Native Americans. Please share what was taught when you were a student and whether learning more about their experience during the Revolution and beyond changes your views. J. M. Hochstetler is the daughter of Mennonite farmers and a lifelong student of history. She is also an author, editor, and publisher. Her American Patriot Series is the only comprehensive historical fiction series on the American Revolution. Northkill, Book 1 of the Northkill Amish Series coauthored with Bob Hostetler, won Foreword Magazine’s 2014 Indie Book of the Year Bronze Award for historical fiction. Book 2, The Return, received the 2017 Interviews and Reviews Silver Award for Historical Fiction and was named one of Shelf Unbound’s 2018 Notable Indie Books. One Holy Night, a contemporary retelling of the Christmas story, was the Christian Small Publishers 2009 Book of the Year and a finalist in the Carol Award. 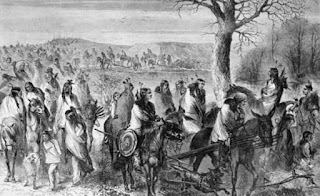 J. M., informative and interesting post about Native Americans and their war for independence. The more I read about American History the deeper the appreciation for Native Americans but also sadness with all they endured and lost. I feel the same way, Marilyn, and am also deeply appreciative of how many Native Americans have served in our armed forces with honor and distinction from the Revolution on in spite of the injustices they suffered. I hope my stories help to bring this neglected history to more Americans so they can be given the credit they deserve. Interesting post, Joan! I've read (and knew) some of this. You know, Whenever I read about the NA's, my heart goes out to them with everything that they went through, suffered and lost. So many of their traditions are lost. There were some really bad NA's but, there were also many whites just as bad. That's so true,Bev! There are bad people in all cultures and races. The Indians suffered a great deal of injustice, and teaching the truth will hopefully help prevent this kind of thing in the future. I never knew these facts and it is sad that this isnt told in histiry books. But- the other thing I have learned is many schools, in particular high schools, no longer teach history. And that, too, is alarming.